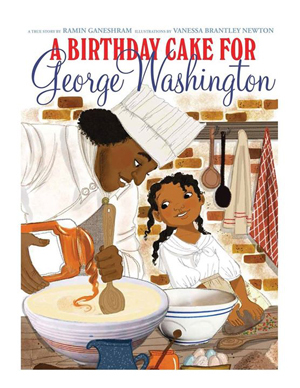 “A Birthday Cake for George Washington” was released Jan. 5 and had been strongly criticized for its upbeat images and story of Washington’s cook, the slave Hercules and his daughter, Delia. Its withdrawal was announced Sunday. “While we have great respect for the integrity and scholarship of the author, illustrator, and editor, we believe that, without more historical background on the evils of slavery than this book for younger children can provide, the book may give a false impression of the reality of the lives of slaves and therefore should be withdrawn,” the children’s publisher said in a statement released to the AP. The book, which depicts Hercules and Delia preparing a cake for Washington, has received more than 100 one-star reviews on Amazon.com. As of Jan. 17, only 12 reviews were positive. The book also set off discussions on Facebook, Twitter, and elsewhere on social media. While notes in “A Birthday Cake for George Washington” from author Ramin Ganeshram and illustrator Vanessa Brantley-Newton had pointed out the historical context of the 18th century story and that Hercules eventually escaped, some critics faulted Ganeshram and Brantley-Newton for leaving out those details from the main narrative. In a Scholastic blog post from last week, Ganeshram wrote that the story was based on historical research and meant to honor the slaves’ skill and resourcefulness. “How could they smile? How could they be anything but unrelentingly miserable?” Ganeshram wrote. “How could they be proud to bake a cake for George Washington? The answers to those questions are complex because human nature is complex. Brantley-Newton, who has described herself as coming from a “blended background — African American, Asian, European, and Jewish,” has illustrated the children’s series “Ruby and the Booker Boys” among other books. The editor was Andrea Davis Pinkney, also an author who in 2013 won a Coretta Scott King prize for African American children’s literature. The pulling of the Washington book also recalls a similar controversy from last year. “A Fine Dessert,” written by Emily Jenkins and illustrated by Sophie Blackall, was criticized for its cheerful depiction of a 19th century slave mother and daughter as they prepared a blackberry recipe. Jenkins apologized, saying that her book, which she “intended to be inclusive and truthful and hopeful, is racially insensitive.” (“A Fine Dessert,” released by the Random House imprint Schwartz & Wade, remains in print).